When you properly set up Touch ID to unlock your iPhone or iPad, many users add several different of their fingers to the configuration so that they can unlock the iOS device in different orientations. That’s a good idea, but sometimes you may want to change which fingers (or whose fingers) are allowed to access and unlock the Touch ID sensor, and to do so you’ll probably want to delete old finger prints from the Touch ID database in iOS. Removing a fingerprint from Touch ID on the iPhone and iPad is actually quite simple, and you can either delete one or all stored fingerprints using this method. Remember that using Touch ID and a passcode is highly recommended, so only remove fingerprints if you’re going to either add new ones or set a passcode in general, this helps to secure the device and protect it from prying eyes. Remember that there is a limitation of five fingerprints per iOS device, so if you remove a few you’ll likely want to add a new one again, if not add the same finger a few times so that Touch ID is more reliable on the iPad or iPhone. Well, sorry if I sound ungrateful, but really?!!! You know from this guide that it just MUST be holiday time! Anyone with the smallest smidgen of intuitiveness would surely figure this out for themselves?! Alternatively, how about a guide to pairing Bluetooth headphones, or getting Home Sharing to work reliably on an iOS device? That last one is a bit unfair, as after all even Apple haven’t figured that one out! Perhaps future guides like this should come with the heading ” I Don’t Know iOS: A Series for Complete iOS Novices”! 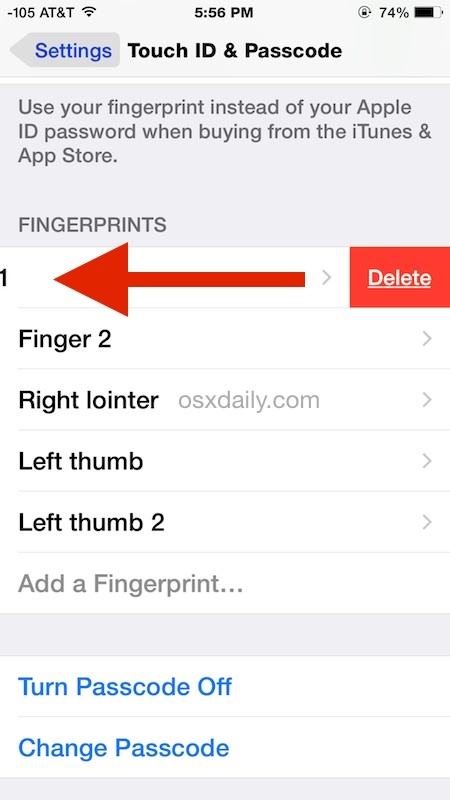 Yes really, this is an article about how to remove fingerprints from iOS devices. If you already know how to do this, then you may not learn something new from an article with such a headline, so perhaps focus on the more advanced topics we cover. But, many many other readers are not as well versed in iOS as yourself, so it can be helpful to them to learn what may be simple to you and other advanced users. In this specific case, many people setup Touch ID when they first get an iPhone and have no idea they can change or delete the fingerprints down the road. This column rocks. When I upgraded from Windows to Mac I stumbled across it and I have regularly learned something new from the daily articles. It is now my first search when I want to go & find out how to do something with my Mac. Yes, sometimes I know what’s being explained, but the gold nuggets I come across more than make up for those columns I skip. I knew how to delete fingerprints, but one thing I never thought of was multiple impressions of the same finger to improve accuracy. I try to do both thumbs and one index finger, but my left thumb never works well. I’m going to try two impressions. Thanks for that tip. Some people are just rude. If you don’t like the topic of the tip just don’t read it! Didn’t cost you anything. Nearly every thing you mention they have written about many times, you should use the Search feature to find them if you’re actually interested in learning about those topics. Maybe you need a tutorial on using website search? Maybe they should write that next? Like Rich, I never thought about multiple impressions of the same finger. I always use my right thumb, but after a few weeks my iphone 5s stops recognizing it for some reason. This is a very helpful idea. I really like OSX daily. Keep up the good work. I have found that the Touch ID is nearly useless now that it is winter. My fingers, the thumbs in particular, are always dry and cracked to the point that the finger prints are unrecognizable. This seems to be a major flaw in the whole recognition idea. It would be a major pain if this was the only way to unlock my phone. I have noticed this too! I thought I was the only one but now that it’s winter my iPhone Touch ID fails constantly, so maybe it’s because the fingers dry out and the impression and ridges change a bit? Indistinguishable to me but maybe at some micro level they look different? The feedback is appreciated. You may find it useful to know that we have written about resolving the spinning beachball in a variety of situations, performing numerous different hardware tests, running a very wide variety of network tests, and resolving and understanding many different error codes. These topics and many others can be found in our archives if those subjects interest you. As for things that are underneath your specific skill level or aimed at newbies, not everyone shares the same aptitude of Apple products, which is why we cover a broad range of topics aimed at a broad range of knowledge levels. As Ryan suggests, using the “Search” feature in the upper right corner of the website is an easy way to find articles and topics on any specifics you are looking for, particularly things that are beyond the front page or the freshest items in the RSS feed. Paul, I don’t read or use your website, so there is no need for me to search. As far as me knowing about previous articles, must have been before the your Twitter feed to my cell. I’m not the expert on Apple products but find your articles very basic and drawn out. I also have noticed that articles are unnecessarily repeated with many , perhaps too many tweets a day. There have been some articles that I’ve learned from and found of interest along with some useful tips. Your comments of articles in the “archives”, indicates a long time ago as i was referring to. @Tim, what does your comment have to do with removing data from Touch ID? I don’t find your off-topic comments and ranting to be helpful or informative at all, maybe you should stop complaining or keep it to yourself. I’m not here talking about my tea this morning for a reason. Stay on topic or go away. Douglas … Read Pauls comment to mine. Don’t care what u say or think and dude your not the moderator. Im expressing my opinion, u don’t like it … too bad. Very good, u understand my words were not tips, thou at the end there was a excellent tip by me. Hey why don’t u tell Paul to stay on topic as well. Further, how did the other comments help u ?? Really , lol. Cuz they sure didn’t help me. Seemed like there was some complaining and no useful info Don’t ya think now there doug.